My name is Katelyn Baier. I'd like to tell you about an exciting foundation that I have started along with my little sister Shannon. It is called Blankets for a Brighter Day. In September of 2008, I was diagnosed with Crohns Disease. I have had three surgeries, many procedures and hospital stays, mostly at Minneapolis Children's Hospital. During my different procedures and hospital stays I met a group of people who work in the Child Life Department at the hospital. Child Life works to make every child's health care experience a positive one. They work with children and adolescents to minimize the stress children can feel during hospital stays or visits to the clinic, emergency room, radiology or surgery area. I have received many benefits from the Minneapolis Children's Hospital Child Life Department. My journey with Crohns Disease has also brought me to Cleveland Clinic in Cleveland, Ohio. During one particularly difficult radiology test, I received a tie blanket. That tie blanket made my day a little brighter and helped me get though that difficult procedure. I continue to bring that tie blanket to difficult procedures or hospital stays. Given my positive experiences, I decided I wanted to make someone's day brighter. I want to make an impact. 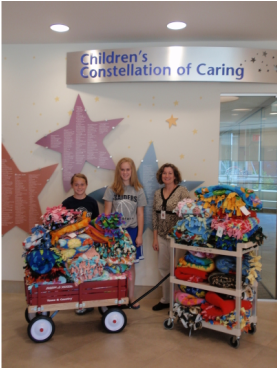 Therefore in April of 2011, Shannon and I started a foundation that provides tie blankets to patients of Minneapolis Children's. We are always looking for people and/or organizations to donate. Blanket donations are always needed, and monetary donations allow us to buy fleece for organizations that want to contribute, but can’t afford to buy the material needed. If you are an organization who wants to make blankets, but needs material – click on the “contact us” tab to get in touch. BLANKETS FOR A BRIGHTER DAY IS NOW DESIGNATED A 501(c)(3) FOUNDATION! 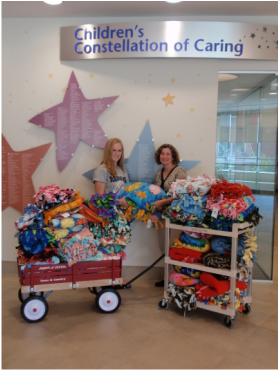 ​Thank you to everyone who helped us in this journey, we are excited to continue our work in providing tie blankets to patients of Minneapolis Children's Hospital! Make sure to follow us on Twitter @BFABD and Like us on Facebook for updates and more information. ~ Thank you to many individuals who are not part of a organization but donated blankets! We have had so many individual donations lately. It is so appreciated! We have had blankets mailed from as far as Florida and Canada. ~ THANK YOU SO MUCH TO BEST BUY FOR THEIR GENERGOUS MONETARY DONATION. WE SO APPRECIATE YOUR CONTINUAL SUPPORT! ~ WE WANT TO SAY THANK YOU TO THE KIND INDIVIDUALS WHO CONTRIBUTED A GENEROUS DONATION TO BLANKETS FOR A BRIGHTER DAY. * Thank you so much to St. Patrick's School Spirit family's for donating blankets! Thank you so much for your support! * Thank you to St. Patrick's Parish for making 55 blankets during the Got Time Event. Thank you for your support! * Thank you to the U13 Hudson Girls Soccer team for making 44 blankets. We really appreciate it! * Thank you to 5 Star Professional for their donation of 33 blankets! We truly appreciate it! * Thank you to Erica Shelton and the Stillwater Girl Scout Troop for making 17 blankets. We appreciate your support. The hospital has a protocol which requires the hospital to wash all blankets prior to delivering them to the children. As a result we sew on fabric labels that go on all of the blankets before they are delivered. We have reached 3,000 blankets!! So excited!